Occasionally we purchase special items that have more imperfections than our usual fare. The condition rating will reflect this, and the flaw(s) will be clearly noted. Any repairs (other than, e.g., simple seam closures) will be disclosed. On very rare occasions, we may have an item that we do not feel we can repair properly, but the item is so nice we will still offer it here–with full disclosure. All items with noticeable flaws or with repairs are priced to account for these. See this dress for an example. Copyright © 1999-20013 by A. M. Cook, Vintage Baubles. Note: All images and descriptions on this site are covered under the U.S. Copyright Law. They may not be reproduced for any reason by any means without written permission. Site designed by South & Hickory Concept & Design, and maintained by A. M. Cook. 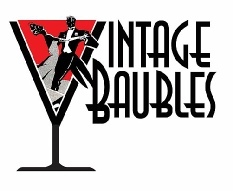 Use our shopping cart or e-mail us at orders@vintagebaubles.com. Some items qualify for free or discounted shipping, which is noted in the listing, and we must send you a manual invoice. In that case, you can still place items in your shopping bag and indicate “phone order.” Then e-mail or call us, and we will send you a manual invoice with the correct shipping amount. Please do not hesitate to contact us if you experience any problems in placing your order or if you have questions prior to finalizing it! When we receive your order, we'll email a confirmation to you. Items are generally shipped within two (2) business days of receipt of cleared payment. If you require expedited shipping, please let us know at the time you place your order. Expedited shipping methods such as USPS Priority or Express Mail may result in additional charges. Note: All items are sold on a first-come/first-served basis. We will place an item on “hold” for up to 48 hours. The item must be ordered within that timeframe, and payment arrangements made, or it is returned to active status. Returns are accepted if we’ve overlooked a serious flaw, which is very rare, but we are all human…. Generally, returns will not be accepted for size issues, as we give very detailed measurements; it is up to you to determine if the garment will fit. Please see our sizing tips, and contact me prior to ordering if you are still unsure about fit. We will do our best to help you. If we’ve made an error in measuring, we’ll accept a return. Returns for other reasons are considered on a case-by-case basis. Restocking fees may apply. In all cases, you must contact us prior to sending the item back, within three (3) days of its receipt. The return package must be postmarked within five (5) days of receipt, and the item must be returned in the condition in which it was shipped. Special-occasion dresses are generally not returnable, except under very limited circumstances. As a final note, please remember that computer monitors are all different, and the color that shows on your monitor may not be exactly the color of the item. Please allow for such color variations. If an item is of a color that’s difficult to photograph properly, I try to describe it accurately as possible. Really, I’m easy to deal with, but I have to “lay out the rules” so that we are in agreement as to the terms of sale! Thank you for your understanding. All personal information collected is solely for the purpose of order fulfillment and/or customer service, including notifications of special promotions and sales. We do not sell or otherwise share customer information with any third party. Ever. 9 a.m. to 5 p.m. EST.